Itâ€™s time for tax planning and working on amended, extended and late income tax returns. Remember Motherâ€™s Day on May 13! Eleanor Gray celebrates her 90th birthday. California backs off real estate tax deduction issue. Sales tax proposed for many services in California. Want to make federal tax payments on the internet? New IRS instructions are issued for automatic change of accounting for new repair regulations. 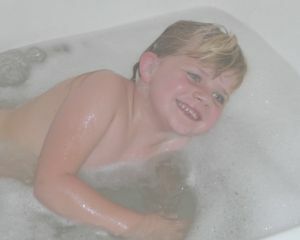 My granddaughter, Kara Siemer, takes a bubble bath at a recent sleepover at Grandma and Grandpa's house. Kara turns age five this month. Now that April 17 has passed, people are calling wanting a second look at the income tax returns that were filed for possible amended income tax returns. Taxpayers who filed extensions are also looking for help income getting their tax returns done. If you would like our help, call Dawn Siemer on Mondays, Wednesdays and Fridays from 9 a.m. to 5:30 p.m. Pacific Time to make an appointment. Dawnâ€™s telephone number is 408-918-3162. See below about when I will be available. Let your mother and other influential mothers know how much you appreciate their contributions to your life. Janet and I will be on a vacation Panama Canal cruise starting April 28 and returning May 14. I wonâ€™t be checking email or voice messages during our vacation. Call Dawn Siemer to make an appointment to see me when I return. April is a big month for birthdays in my family. My daughter, Dawn Siemer, her husband, John, and daughter, Kara, all have April birthdays. My mother, Eleanor Gray, is celebrating her 90th birthday this year. Happy Birthdays! My mother, Eleanor Gray, is celebrating her 90th birthday this month. We are glad to still have her with us in reasonably good health. Mom grew up in Glendale, close to Los Angeles during a golden age of movies and movie stars. She once had a great autograph collection, but my grandmother threw it away! She met my father, Aubrey, when he rented a room at her next-door neighborâ€™s house. She traveled alone across the country to marry him in Montreal, Quebec, Canada when she was 18 years old. They were married for 67 years when Dad passed away. They settled in California and had six children, three still living, and many grandchildren and great-grandchildren. They lived in a marvelous community of friends who have stayed close for over 50 years. Mom and Dad were great role models, and we treasure them. After the IRS issued IRS Information Letter 2012-0018, indicating that real estate taxes donâ€™t have to be ad valorem taxes to be tax deductible, the California Franchise Tax Board backed off its position of disallowing deductions for most special assessments, and will not require special disclosure relating to disclosing parcel numbers on the 2012 California income tax return. Unfortunately, these announcements happened right at the end of tax season. Itâ€™s probably not worth the hassle of filing an amended return to claim an additional deduction. Proposed legislation, AB 2540, would impose a 7.5 % California sales tax on 27 types of businesses, including private tutoring, carpet cleaning, furniture repair, live theater tickets, and high net worth estate planning. The tax would not initially apply to tax return preparation or most legal services. The tax on â€œsomeâ€� services could create more confusion in the marketplace about when it applies. More people are seeking the convenience of making federal tax payments on the internet. It takes some lead time to get it set up. For details, see my article on the subject at www.taxtrimmers.com/payments.shtml. The IRS has issued new instructions for Form 3115, Application for Change of Accounting Method. The instructions cover automatic accounting changes under the new regulations for repairs under Revenue Procedures 2012-19 and 2012-20. If you have a business or rental properties, you should discuss whether to file for a change of method under the new regulations. Financial Insider Weekly broadcast schedule for April, May and June.